Attendant! on the Person. “No man is a hero to his valet,” saith the proverb; and the corollary may run, “No lady is a heroine to her maid.” The infirmities of humanity are, perhaps, too numerous and too equally distributed to stand the severe microscopic tests which attendants on the person have opportunities of applying. The valet and waiting-maid are placed near the persons of the master and mistress, receiving orders only from them, dressing them, accompanying them in all their journeys, the confidants and agents of their most unguarded moments, of their most secret habits, and of course subject to their commands,—even to their caprices; they themselves being subject to erring judgment, aggravated by an imperfect education. All that can be expected from such servants is polite manners, modest demeanour, and a respectful reserve, which are indispensable. To these, good sense, good temper, some self-denial, and consideration for the feelings of others, whether above or below them in the social scale, will be useful qualifications. Their duty leads them to wait on those who are, from sheer wealth, station, and education, more polished, and consequently more susceptible of annoyance; and any vulgar familiarity of manner is opposed to all their notions of self-respect. Quiet unobtrusive manners, therefore, and a delicate reserve in speaking of their employers, either in praise or blame, is as essential in their absence, as good manners and respectful conduct in their presence. His day commences by seeing that his master’s dressing-room is in order; that the housemaid has swept and dusted it properly; that the fire is lighted and burns cheerfully; and some time before his master is expected, he will do well to throw up the sash to admit fresh air, closing it, however, in time to recover the temperature which he knows his master prefers. It is now his duty to place the body-linen on the horse before the fire, to be aired properly; to lay the trousers intended to be worn, carefully brushed and cleaned, on the back of his master’s chair; while the coat and waistcoat, carefully brushed and folded, and the collar cleaned, are laid in their place ready to put on when required. All the articles of the toilet should be in their places, the razors properly set and stropped, and hot water ready for use. Gentlemen generally prefer performing the operation of shaving themselves, but a valet should be prepared to do it if required; and he should, besides, be a good hairdresser. Shaving over, he has to brush the hair, beard, and moustache, where that appendage is encouraged, arranging the whole simply and gracefully, according to the ago and style of countenance. Every fortnight, or three weeks at the utmost, the hair should be cut, and the points of the whiskers trimmed as often as required. A good valet will now present the various articles of the toilet as they are wanted; afterwards, tho body-linen, neck-tie, which he will put on, if required, and, afterwards, waistcoat, coat, and boots, in suitable order, and carefully brushed and polished. Having thus seen his master dressed, if he is about to go out, the valet will hand him his cane, gloves, and hat, tho latter well brushed on the outside with a soft brush, and wiped inside with a clean handkerchief, respectfully attend him to the door, and open it for him, and receive his last orders for the day. He now proceeds to put everything in order in the dressing-room, cleans the combs and brushes, and brushes and folds up any clothes that may be left about the room, and puts them away in the drawers. Gentlemen are sometimes indifferent as to their clothes and appearance; it is the valet’s duty, in this case, where his master permits it, to select from the wardrobe such things as are suitable for the occasion, so that he may appear with scrupulous neatness and cleanliness; that his linen and neck-tie, where that is white or coloured, are unsoiled; and where he is not accustomed to change them every day, that the cravat is turned, and even ironed, to remove tho crease of the previous fold. The coat collar,—which where tho hair is oily and worn long, is apt to get greasy—should also be examined; a careful valet will correct this by removing the spots day by day as they appear, first by moistening tho grease-spots with a little rectified spirits of wine or spirits of hartshorn, which has a renovating effect, and the smell of which soon disappears. The grease is dissolved and removed by gentle scraping. The grease removed, add a little more of the spirit, and rub with a piece of clean cloth; finish by adding a few drops more; rub it with the palm of the hand, in the direction of the grain of the cloth, and it will be clean and glossy as the rest of the garment. Polish for the boots is an important matter to the valet, and not always to be obtained good by purchase; never so good, perhaps, as he can make for himself after the following recipes:—-Take of ivory-black and treacle each 4 oz., sulphuric acid 1 oz., best Olive-oil 2 spoonfuls, best white-wine vinegar 3 half-pints: mix the ivory-black and treacle well in an earthen jar; then add the sulpharic acid,continuing to stir the mixture; next pour in the oil; and, lastly, add the vinegar, stirring it in by degrees, until thoroughly incorporated. It is, perhaps, unnecessary to add, that having discharged all the commissions intrusted to him by his master, such as conveying notes or messages to friends, or the tradesmen, all of which he should punctually and promptly attend to, it is his duty to be in waiting when his master returns home to dress for dinner, or for any other occasion, and to have all things prepared for this second dressing. Previous to this, he brings under his notice the cards of visitors who may have called, delivers the messages he may have received for him, and otherwise acquits himself of the morning’s commissions, and receives his orders for the remainder of the day. 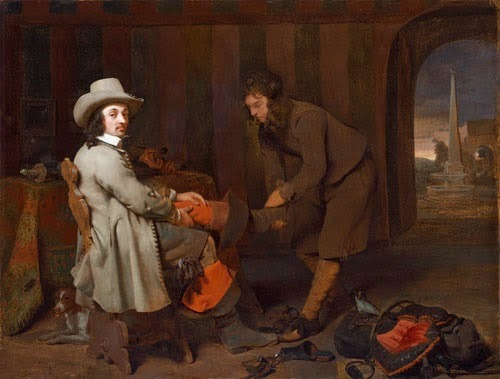 The routine of his evening duty is to have the dressing-room and study, where there is a separate one, arranged comfortably for his master, the fires lighted, candles prepared, dressing-gown and slippers in their place, and aired, and everything in order that is required for bis master’s comforts.